Valentine's Day: Special Mount and Clothing for You! What do you want most for upcoming Valentine's Day? Lover's companion, the gift you have been long for, or Valentine's Day party in LoA2? League of Angels II invites all warriors to join in a series of Valentine's Day events in game from Feb. 6th to Feb. 14th. From Nov. 6th to 9th, new Mount Winged Chariot and many other resources will be available in Single-Server Resource Tycoon. From Feb. 10th to 14th, new Clothing Love Guardian as well as many other clothing can be gained in Valentine's Special. Let's know more about Valentine's Day event. 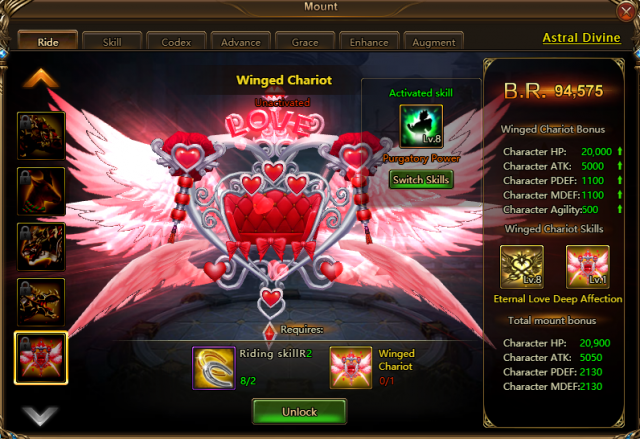 Winged Chariot is a perfect mount for Valentine's Day. A beautiful chariot driven by pink wings is the dream mount in fairy tales. Sitting on the Chariot will bring you the feeling of happiness. Beside the beautiful image, it will endow the character with great power. Winged Chariot is an Artifact Grade mount. It will show up during Single-Server Resource Tycoon from Feb. 6th to 9th. Let see how helpful it is. Increase the ATK, HP, and Healing effects of the entire squad by 19.5%, and restore 8.75% HP to each ally at the end of each round for 5 rounds. Restore 120 Rage to the target ally each round, and increase Healing done by 22.5%. Deal ATK*(391%+14580) DMG to a column of enemies and reduce their ATK by 30% and healing received by 40% for 1 turn (this effect ignores immunities). Restore ATK*(202%+7530) HP to the 2 allies with the lowest HP, increase their DEF by 20%, and give them a shield equal to 10% of their max HP for 1 turn. 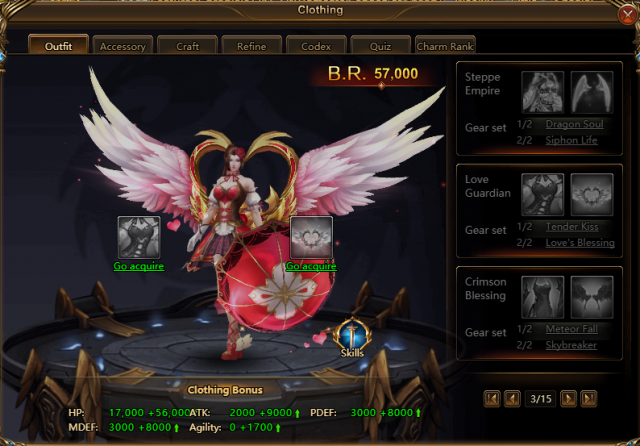 Come and join us in Valentine's Day events in League of Angels II! You can get the new clothing, new mount and many other items at great discounts! Stay tuned for more contents and have a great time playing LOA II! Last：New Artifact Hero Valorian Debuts on Sapphire! Next：Lucky the Pig Gives Lucky Blessings!